I really loved this book. It was strange, in typical Murakami style, but something about it felt more mature, more deeply reflective than his other novels. It is a story about childhood friendships that have been lost to adulthood, dreams that have faded, and opportunities missed, and also about finding the courage to hold onto the things your truly love. The story follows Tsukuru Tazaki, a 36 year old man who was abandoned by his close group of high school friends at the age of 20. He has never really recovered from this experience, and the plot follows his ‘pilgrimage’ to restore balance to his life. Despite the emotional upheaval the protagonist experiences there is a deep sense of calm that wraps itself around the story. Because of this it feels quite different to the other novels I have read by Murakami, where often there is a feeling of incredible tension and risk from an unknown source. Perhaps this is because Murakami, born in 1949, is now 66 years old (65 at the time of publication), or perhaps there is another reason for this shift. There are common themes of lonliness, isolation and introspection common across all his work, but in this instance there is a touching sense of acceptance of life that really appeals to me. I can’t think of anything I disliked about this book. The pace and length are perfect to tell a story that is both a simple coming of age tale and a complex look into the ways in which we build our sense of self. 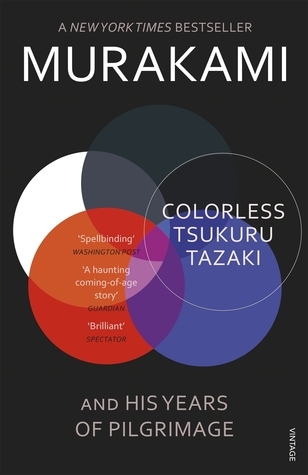 Murakami fans will love this addition to his prolific career as an author, but I also think this is a great novel to start with if you are not familiar with his peculiar style. I highly recommend it, it’s not a long read -at under 300 pages it’s the shortest of his novels I’ve read- but it has a beautiful balance between whimsy and introspection. Definitely a story that will keep me pondering for a while.